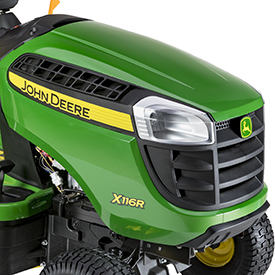 The X116R Rear-Discharge Rear-Collect Tractor comes with a single-cylinder engine, automatic transmission with easy-to-use foot controls, 92-cm (36-in.) Edge mower deck, and 300-L hopper. 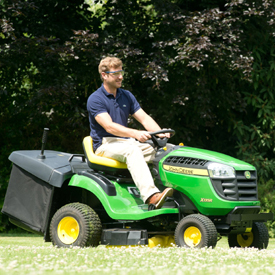 The X116R is designed for customers who want the highest-quality product for mowing and collecting grass clippings and leaves. The 92-cm (36-in.) mower deck does an excellent job of mowing and collecting grass clippings. 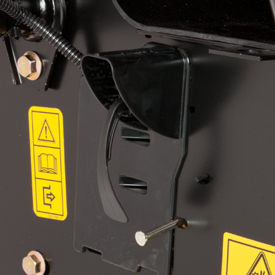 The hopper is easy to remove and can be replaced with an optional discharge deflector or mulch plug, for times when it is not desirable to collect the material. 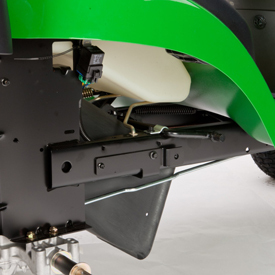 A rear hitch is included and can tow a wide variety of equipment that can do almost any lawn-care job. No-tools oil-drain valve is easy to access when changing the engine oil. Fuel level is easy to check. Convenient location - sight gauge can be seen from the operator’s seat. Fuel tank capacity is 8 L (2.1 gal.). A Kanzaki Tuff Torq hydrostatic transmission is used. It has the performance requirements to ensure excellent performance and reliability. 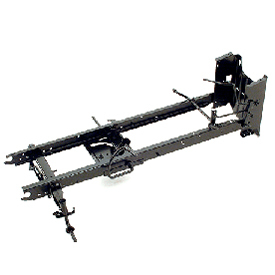 Full-length robotically welded frame has high-strength steel rails for superior reliability and long life. Automotive-like steering system with sector-and-pinion steering gears provide a very strong, low-effort, and tight-turning system. Grease fittings allow regular lubrication to help maintain easy steering and minimize wear. Large, 1.9-cm (0.75-in.) diameter front wheel spindles provide excellent durability. JD Loy material is tough and durable. Color is molded in for long-lasting good looks. 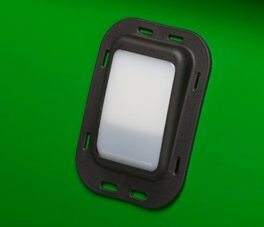 UV-resistant JD Loy material resists fading. Openings on the side of the hood let in plenty of cooling air while keeping the sound level low. Two headlights provide good lighting for night-time operation. 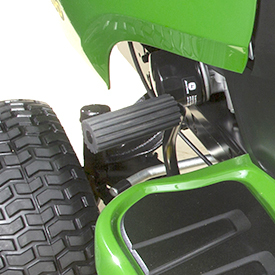 Controls are positioned where they are easy to reach and use to control the tractor. 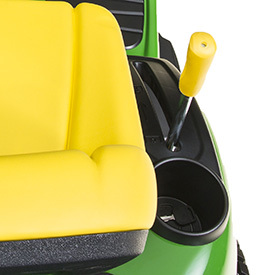 The steering wheel is positioned and angled to give the operator plenty of room and steering comfort. 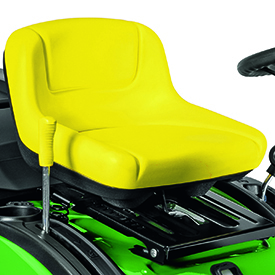 The seat is tilted back at the optimum angle to provide the most comfortable operator position. Ignition switch is on the dash for starting ease. 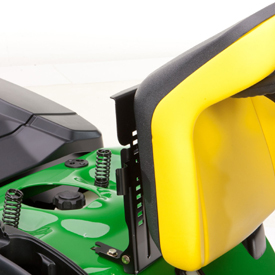 A comfortable operator seat has a higher back for extra operator comfort. 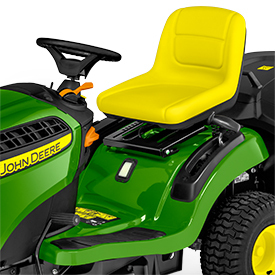 A comfortable seat is especially helpful when operating the tractor for extended periods of time. Seat-back height is 27.9 cm (11 in.). 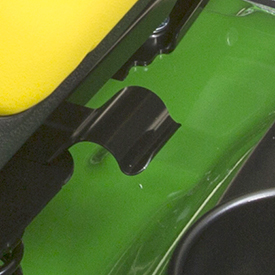 Seat can be tilted forward for protection from the weather and to provide easy access to the fuel tank. Seat springs absorb bumps to give a smoother ride. Seat can be easily adjusted forward or backward while in the seat, with seat travel of 140 mm (5.5 in.) and 10 different positions. 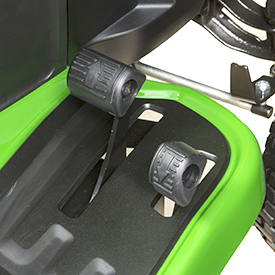 A beverage holder is located on the right-side fender for operator convenience. 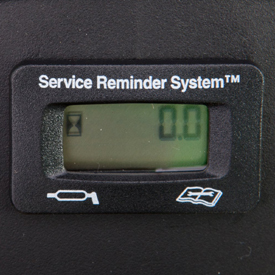 The hour meter makes it easy to tell when oil changes and other maintenance should be performed. Controls are color coded and labeled for easy identification by the operator. The functional design of the controls provides a good appearance and comfortable feel. Increments of 0.64-cm (0.25-in.) allow the operator to fine-tune the cut height. The operator can change direction without lifting foot off the platform. 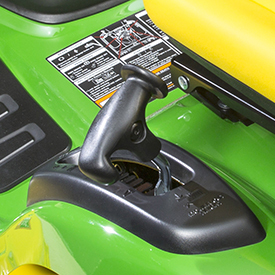 The mower deck is engaged with the yellow lever on the dashboard. 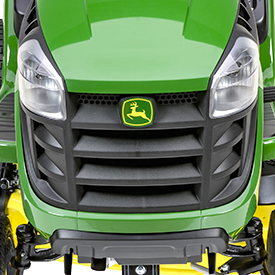 Its placement on the right side leaves the left, entry side of the tractor unobstructed. Use the rear handle to raise the back of the hopper 25 degrees, or about 13 cm (5 in. ); then using both handles, lift the hopper vertically out of the notches. There is nothing to disconnect. With the hopper removed, cleaning the hopper or the grass chute is easy. 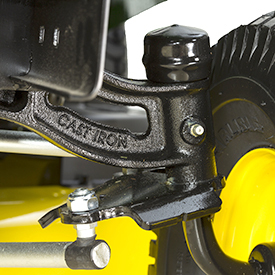 A tow-release lever is provided for moving the tractor without the engine running. The hour meter shows the number of hours the engine has run. 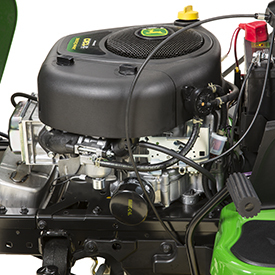 The service reminder will indicate that a general lubrication or mower/engine service interval has been reached. When service is required, the service reminder will flash for one hour. Follow the service timetable in the operator’s manual. Hood opens for convenient access to important service areas. 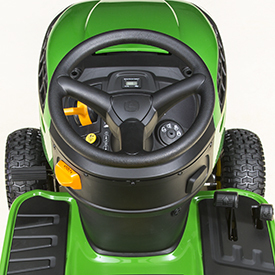 Mowing while backing up is strongly discouraged. 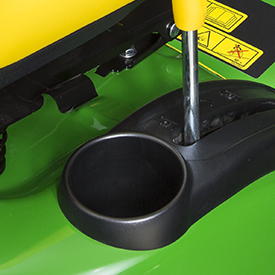 The operator who deems it necessary to keep the mower (or other implement) engaged while backing up should first bring the tractor to a stop and look behind the tractor to be sure there are no bystanders. Then actuate (push in) the RIO button. 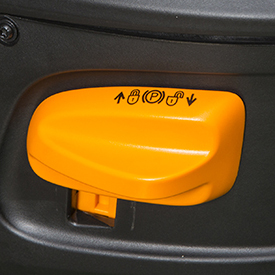 The RIO button must be held down in the reverse implement position as the shift lever is moved into reverse (reverse foot pedal is depressed on models with a hydrostatic transmission). 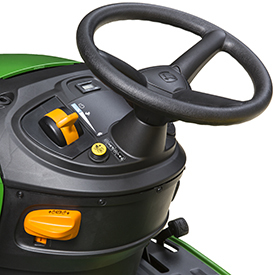 The operator may then release the button and the mower will continue to operate while backing up and also when resuming forward operation. This procedure must be repeated the next time the operator chooses to keep the mower engaged while backing up. 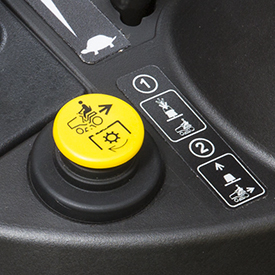 If the mower power take-off (PTO) is engaged and the operator shifts into reverse or depresses the reverse pedal prior to pressing the RIO button, ignition to the engine will be shut off. The engine will stop unless the operator either pushes on the RIO switch or shifts out of reverse. 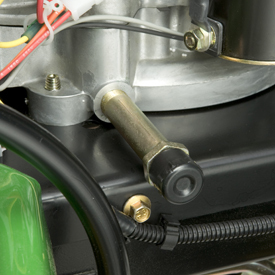 If the engine does stop, the operator must return the mower engagement (PTO) switch or lever to the off position, depress the brake pedal, and then turn the ignition switch to restart the engine. 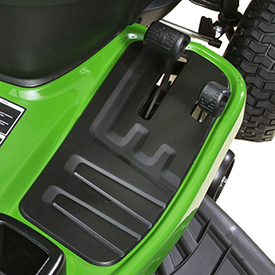 The mower deck is stamped from 12-gauge, 2.7-mm (0.105-in.) steel to provide smooth contours for a quality appearance and excellent performance. 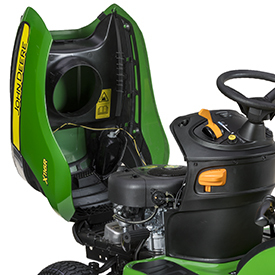 With no side-discharge chute, the mower can trim on either side for mowing efficiency and convenience. A smaller storage area requirement is an additional benefit. A standard V-belt and non-timed blade design gives superior reliability and trouble-free operation. 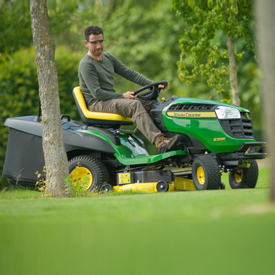 Offset mower blades permit blade overlap with the use of a standard V-belt drive. The blades cut cleanly without being able to contact each other. 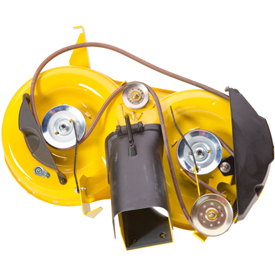 A heavy-duty V-belt and large spring-loaded idler pulley transfer power to the mower blades efficiently and reliably. Cut-height increments of 0.64 cm (0.25 in.) allow for operating the mower at the optimum cutting height. A quick-adjust deck-leveling system is provided to make keeping the deck properly adjusted easy. 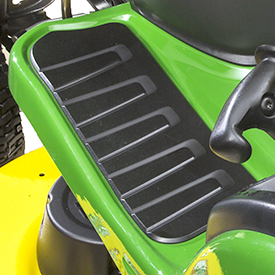 Grass clippings flow smoothly around the deck and up the chute into the hopper. 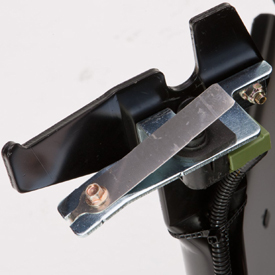 Clipping buildup is minimized to ensure continued high-performance and easy cleanup. Special discharge blades (standard equipment) have a large wing to propel grass clippings up the chute and into the hopper. 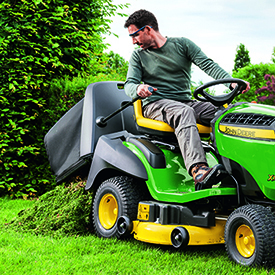 Mower fills and packs the 300-L (8.5-bu) hopper with a large volume of grass clippings and/or leaves. 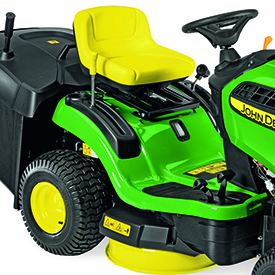 Exceptional mowing and bagging performance begins with the deep-deck design of the mower. The deck is 100-mm (3.9-in.) deep at the front and grows even deeper from front to rear to create a smooth transition into the chute. Wash port is designed for hose quick-connect fitting. 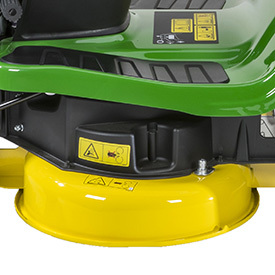 Connect hose and operate the mower to clean. Using the wash port cleans bottom of deck and chute. 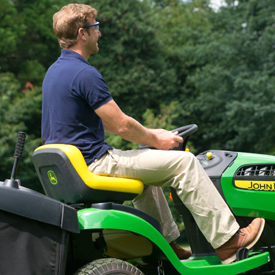 Wash port works best if used immediately after the mowing job is completed. Operating the mower deck while the water is running removes grass clippings. 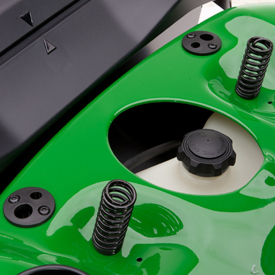 Use of the wash port prevents buildup of material from affecting performance the next time the mower is used. 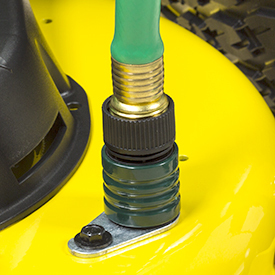 NOTE: A hose-end adapter for the appropriate water hose to be used can be purchased locally for connection to the wash port. 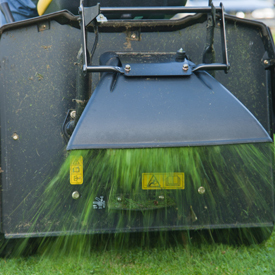 When collecting grass clippings and leaves is not desired, a mulch plug and mulching blades are available. 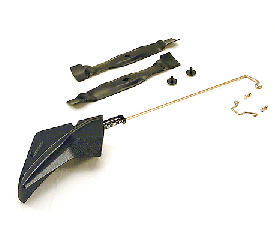 The rear hopper can be easily removed and the mulch plug installed. Plug closes off opening on bottom of deck so material cannot enter the chute. Special mulch blades are provided to optimize mulching performance. 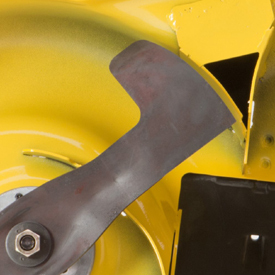 The mulching blades will also provide excellent performance when used with the rear-discharge deflector and good performance for collecting. If collecting in heavy or wet conditions, it may be necessary to reinstall the standard bagging blades for optimum performance. 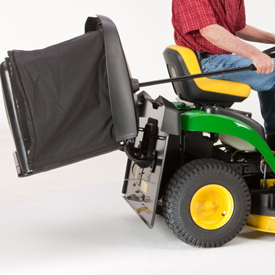 The large-capacity, rear-mounted hopper makes collecting grass and leaves easy. 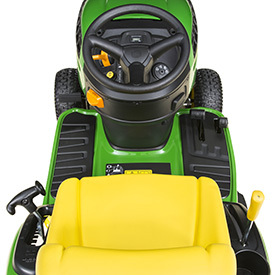 The rear design allows excellent maneuverability when mowing. 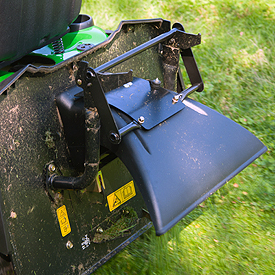 The 300-L (8.5-bu) capacity hopper holds a lot of material for longer mowing times between emptying. Emptying the hopper is easily accomplished from the operator’s seat. 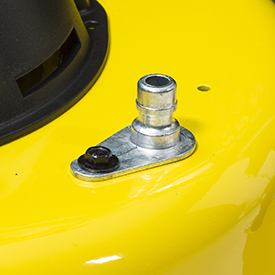 The durable plastic bottom will last a long time, even when operating in rougher conditions. 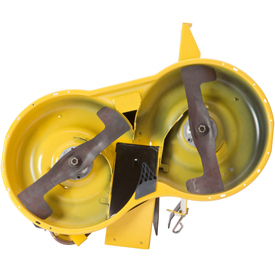 When the hopper is full, a light on the dash will come on and an audible alarm will sound to alert the operator to disengage the power take-off (PTO). 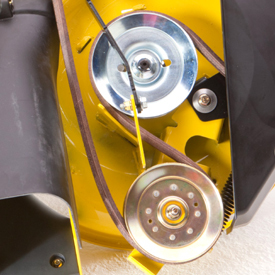 When there is enough material in the hopper to activate the sensing switch, it simultaneously turns on the dash-mounted hopper full indicator light and an audible alarm. This reduces the potential for plugging the system. 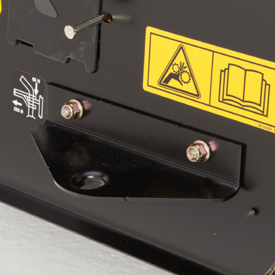 The hopper must be full, with enough material to activate the hopper-full switch, to activate the hopper-full indicator and alarm. The hopper is emptied by pulling up, then forward, on the hopper handle. 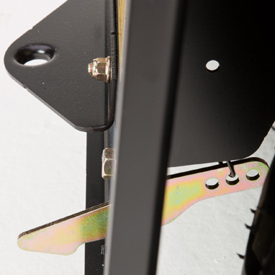 Using the leverage of the long handle, pull forward hard enough to overcome the spring-loaded hopper latch and rotate the hopper upward. The spring can be located in any of three holes. More latching effort is required for hilly or rough operating conditions. 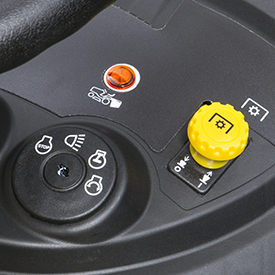 Safety-interlock switches are designed to help protect the operator and others. The operator must be in the seat to start or operate the tractor. 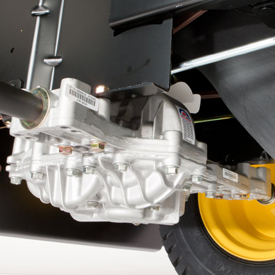 The brake pedal must be depressed or the parking brake set for the tractor engine to start. 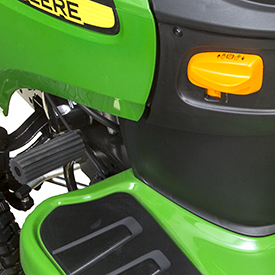 When the hopper is removed, a safety interlock switch will prevent the mower deck from operating unless the rear deflector or mulch plug is installed, however the engine will run and the tractor will operate so the rear hitch can be used. 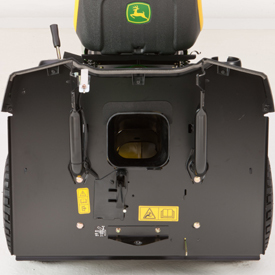 From 01.02 to 30.04.2019*, every John Deere lawn tractor comes with a complimentary Thatcherator attachment.